Heavy duty shelves, posts, 3-sided frames. KP12-A 12" post, replacement component for aluminum beer keg racks. KP34-A 34" post, replacement component for aluminum beer keg racks. KP48-A 48" post, replacement component for aluminum beer keg racks. KP54-A 54" post, replacement component for aluminum beer keg racks. KP68-A 68" post, replacement component for aluminum beer keg racks. KP72-A 72" post, replacement component for aluminum beer keg racks. KP76-A 76" post, replacement component for aluminum beer keg racks. KP84-A 84" post, replacement component for aluminum beer keg racks. KRB1842A 18" x 42" 3-sided frame, replacement component for aluminum beer keg racks. KRB1860A 18" x 60" 3-sided frame, replacement component for aluminum beer keg racks. KRB1880A 18" x 80" 3-sided frame, replacement component for aluminum beer keg racks. KRB1893A 18" x 93" 3-sided frame, replacement component for aluminum beer keg racks. KRS1842A 18" x 42" heavy duty shelf, 2 keg capacity - replacement component for aluminum beer keg racks. 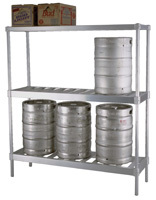 KRS1860A 18" x 60" heavy duty shelf, 3 keg capacity - replacement component for aluminum beer keg racks. KRS1880A 18" x 80" heavy duty shelf, 4 keg capacity - replacement component for aluminum beer keg racks. KRS1893A 18" x 93" heavy duty shelf, 5 keg capacity - replacement component for aluminum beer keg racks.